Have you ever seen those cute signs stating, "she who dies with the most *fill in the blanks* wins"? If the category is purses, I'm a shoo-in for the grand prize. Despite the fact that I could probably change purses every week for a year without using the same one twice I still can't stop myself from looking for more, especially if it has a cat on it. 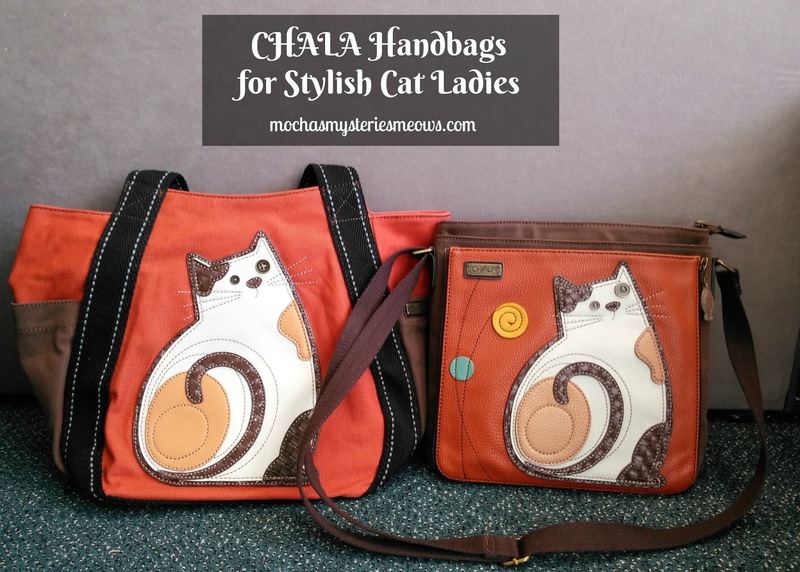 The first time I laid eyes on a CHALA bag was in an Acorn catalog when I was compiling the premiere edition of our Purring Peddler series. I admired it from afar until January when I saw one in person at the Vermont Fancy Felines Cat Show and realized I could not live without one of these bags in my life. CHALA bags are billed as "Sophisticated enough to be at work. Casual enough to go shopping with. Simple enough to carry along wherever you go." and liking what you do is a key to happiness in life. We love fashion, and we love handbags. our ordinary bags a little twist, and seeing people smile. We try to be as simple as possible in life, even when it comes about fashion. We adorn simple bags with just right amount of whimsy, not too fancy or complicated. and we strive to find a perfect balance of them. We like to be bold & different in life, in a harmless way, whenever and wherever possible. is a happy thing to us, too. I've been using CHALA's deluxe messenger bag in the " LaZzy Cat" design for about a month now and it fits my lifestyle perfectly. I crave roomy bags with loads of pockets and hidden compartments and this one is fully loaded. The front pocket is just the right size to carry an iPad or Kindle and is detachable with a cute fish shaped zipper puller. The pocket behind that has a handy magnetic closure which is where I keep my wallet for easy access. The main zippered portion of the bag has 3 more little compartments in the lining for keys or glasses. 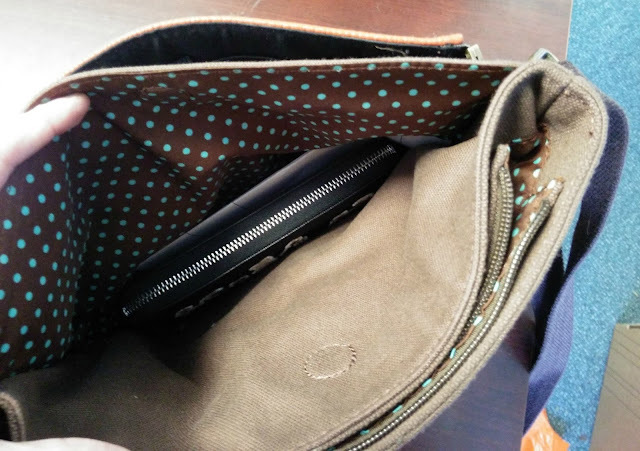 The rear zipper pocket is where I stash my shopping lists and coupons. The messenger bag is canvas and textured faux leather with detailed stitching and button eyes. It feels very sturdy and well made. The strap is completely adjustable so I love that it's long enough to wear crossbody when I want my hands free but can also be worn on my shoulder for quick stops on the go. Even the orange & brown color scheme is right up my alley because they're tortie/calico colors! I was so happy to receive a compliment on it the first time I wore it shopping. If you prefer a design other than a cat (but why would you??? ), dog, fox, turtle and dragonfly messenger bags are also available. The Carryall Zip Tote in the same LaZzy Cat design is incredibly roomy. (Seriously, I could carry Mudpie around in it.) The main zippered compartment has an open inside pocket, two side pockets with velcro closures (good fit for a water bottle), and a rear pocket with a magnetic snap. Carry it along on a day trip or to the beach, use it to carry books or craft supplies, I can even see using it as a carry-on bag on an airplane. The possibilities are endless! Lastly I got my paws on a trio of adorable kitty keychains which could also be used as a purse charm. Available in black, brown and ivory, each comes with a fish and flower dangle with the CHALA logo. I'm almost tempted to remove the clip and wear one as a necklace! I cannot recommend CHALA merchandise highly enough. They're chic and sophisticated, yet practical and whimsical all at the same time. I would encourage everyone to check out their collection on Amazon because they have loads of cute designs and styles. Visit them on Facebook too! Disclaimer: This post is sponsored by CHALA Handbags. All opinions are our own and we never recommend a product we don’t fully believe in. Give Miss Mudpies >>smoochies<< from all of us. Those are really, really cute items - I can see why you couldn't resist! As much as I love my cats and dogs, I honestly don't have any purses or bags with them. I have tons of t-shirts and other items, but would love a cat purse! I only have one cat tote....can you believe it?! I definitely want more - lots more!! A friend of mine has one of their bags, but it is an open-top tote. I had no idea they made a zip-top version. That's so much more practical for carrying stuff you worry could fall out -- or if you're clumsy about where you put bags, like I am! These are great bags! OMC, that is so cute! I don't currently own any cat-themed purses, though I do have a tiger zip-pull (which I think I found through one of your posts). Love their other designs too, especially the dragonfly. Oh my goodness, you are killing me. 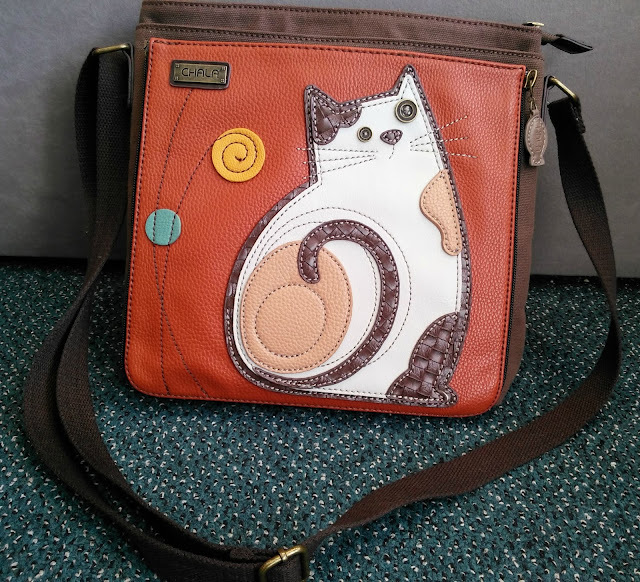 An adorable kitty purse, with a calico?!? Yes, please! I can't even begin to count the number of bags I have with cats (and pups) on them, but what's one (or a few) more? You have a serious way of finding the most wonderful gems for cat ladies, Melissa and Mudpie, and this one is right up there at the top of my list! I have 15 cat themed purses and totes. Beautiful purses. Thanks for the chance. I don't have any, boo-hoo! 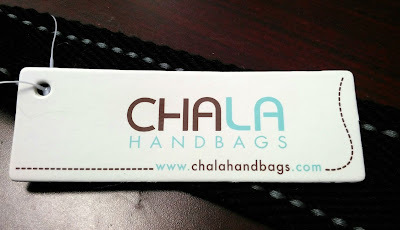 Maybe the CHALA tote will be my first!! OMC! Love it! Our mommy is a bagoholic too and has three kitty totes but this would be purrfect for every day use! She loves crossbody bags too! We're crossing our paws that she wins! I have a Chala bag that my parents got me on their cruise to Europe. It's an adorable tote bag brown color with the cat. I love it but didnt realize there are other styles & key chains. Thanks for the giveaway. I don't have any. This purse is delightful, so creative and practical. I would love this special purse. Thanks, Melissa! I have never owned a cat purse but would love to. Maybe I will get lucky. Love this one. Those are adorable! And we think our Mom could smuggle a cat or two in them! I don't own any, but I would like too... so cute! I have one purse and two totes with cats featured on them. These look like great purses and totes and keychains, would enjoy having one. Aw I LOVE this! I'm in the market for a new purse actually.. I don't have any cat purses at the moment, but adding this to my wish list. Thanks for putting it on my radar! I just own one cat-related purse, but I'd like more! Lots more! Including this one! LOL. OMC That's pawsome....Mom would LOVE one of those!! I want one of those even though I already have several cat purses. We would love to win this for the mom even though she has a ton of purses already. How could we, as calicos, not love a beautiful colorful bag with a calico on it! Great review too! Oh! And we do not own any wonderful cat bags. Or any cat bags. I don't have any cat purses! I don't yet own any cat totes, though I do own a fox purse. I love these, especially the keychains! I used to buy a lot of purses, but have definitely slowed down since I found the perfect one for me. But I do find myself buying a cat purse here and there! I had one cute straw kitty purse that was a gift, but sold it... and there was a small kitty coin purse and I sold that too. Always trying to make wee bits of money for my kitty babies... hope to someday have a purse I can keep! Love this Chala purse, especially since there are several pockets and a divider in the middle. -Katie Kat. I just saw the link to this post on your Selfies post. All these bags caught my eye. I just love the design! I only have one now---but I want more! And I fell in love when I saw these! I don't think I've ever owned a cat themed purse but I think I need too! Thanks for the chance. this bag is super cute and I really need a new purse because mine is ripped and old! I dont have any with cats on them but i love this one! Those are really cute bags and keychains! Our Mommy has a big tote with cats, but no purses with them. These are too cute!! I'm obsessed with them. I have a few cat tote bags, but no purses. Some other things though - a cat mug and a cat pillow. Love them all! I have one backpack with a picture of a cat on it. I have two cat purses. This Chala tote is adorable! So cute! Will be my first cat purse if I win! I don't have any but I think they're cute. Pets in general... probably at least a dozen, if not more! LOVE these bags and cute keychains! No purses but TW does have a couple of cat-themes wallets and about seven tote bags mostly bearing my likeness that she designs on Zazzle..
At least three. I'm a cat lady. Even the orange & brown color scheme is right up my alley because they're tortie/calico colors! I was so happy to receive a compliment on it the first time I wore it shopping. Thanks mate for sharing about these amazing fashion bags also at the https://www.luxtime.su/louis-vuitton-handbags site. These Challa handbags are really amazing, Personally appreciate the good and well shared post.